LG is going to showcase not one but two flagships at MWC later this month. Along with the LG V50 ThinQ with 5G capabilities it will also showthe LG G8 ThinQ. Latest reports from Brazil reveal that the new G-series flagship will have a 3,500 mAh power cell with a nominal capacity of 3,400 mAh. 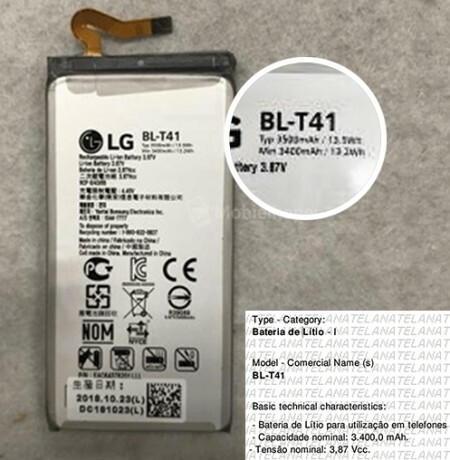 It is about 15% more than the G7 ThinQ battery and the biggest cell in a G smartphone since the G Flex, announced in November 2013. The LG G8 ThinQ will have a 6.1” screen with a notch. It will have a tall ratio of 19.5:9 and dual selfie cameras tucked in the cutout. And the G8 will keep the 3.5 mm audio jack, which is becoming increasing rare these days. LG is staying conservative on the fingerprint scanner, keeping it on the back, right below the dual camera setup. Reports from Korea suggested the company will stop launching devices under the G moniker after the G8 ThinQ, but those are long term plans that can always change.